Reappraisal of property for tax purposes is required on a periodic basis to maintain appraisals at market value and to ensure equity of appraisals throughout the jurisdiction. Every county in Tennessee operates on either a four-, five-, or six-year cycle of reappraisal. Davidson County is on a four-year plan. 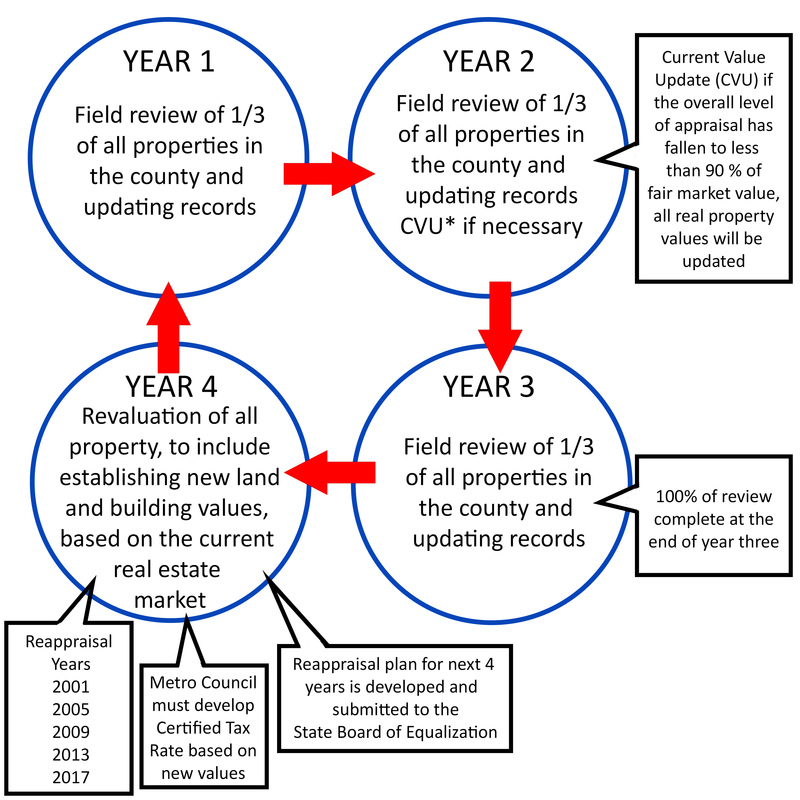 The four-year cycle consists of three years of comprehensive on-site reviews of every parcel in the county, followed by revaluation of all property in the fourth year. During each of these first three years, approximately 33% of the parcels in the county are inspected for changes to the land or buildings that would influence the value of the property. Quarterly progress reports are provided to the State of Tennessee Division of Property Assessments, whose personnel periodically monitor the progress and results of the on-site review process. During the fourth and final year of the cycle, a thorough analysis of the current real estate market is used to establish new land and building values. This is an exhaustive process which establishes the factors, tables, and base rates that will be used to value real property for the next four years. The changes in value are then applied to each property in the county, and those property owners whose property values have either increased or decreased as a result are notified regarding the new appraisal of their properties. In addition, during this fourth year, a complete plan of reappraisal for the next four-year period must be developed and submitted for approval. This plan is required to include budgetary considerations for personnel and equipment and the territorial division of the county for the three years of field review. The cycle then begins all over again. Below is an image showing the Reappraisal Cycle.